Zimbabwe fuel consumption rises 650%? As a net fuel importer, Zimbabwe needs foreign currency to pay for the precious commodity, but low export receipts mean the country does not have adequate hard currency for the imports, especially after consumption sky-rocketed. Energy and Power Development Minister Dr Joram Gumbo, told journalists at a briefing in Harare yesterday that while Zimbabwe had enough stocks at the Mabvuku and Msasa depots, it did not have adequate foreign currency to pay for the fuel. The minister said the fuel is kept at Msasa and Mabvuku for easy access, but it is bonded, and if the fuel is in the source market, it must be paid for first before its release. He said the Reserve Bank of Zimbabwe currently allocates about US$20 million per week towards paying for the fuel imports — accorded the highest priority among many other competing needs - which is being consumed in the country. Other critical needs competing with fuel for allocations by the central bank of the scarce foreign currency are health, manufacturing and mining sectors. The energy and power development minister said if there was enough foreign currency in the country, there would not be any queues for fuel to talk about in Zimbabwe. "The fuel that comes into the country is in bond; is kept at Msasa and Mabvuku in bond. In order for each company that supplies your service station to get that fuel and deliver it to a particular service station they must pay for it in forex and that forex they get it from RBZ. "What that means is that the oil companies in the country have to (first) pay for that fuel through RTGS then the fuel is released to them and a certificate is released to that company in order for them to access that fuel at Msasa and Mabvuku. "The scramble for getting that fuel in forex is what we all know, it is the scramble for the limited resources, the scramble for the limited foreign currency we do not have in the country and the RBZ has to allocate," the minister said. He said the companies that have to get the fuel have to queue for the foreign currency. "Before payment they will be no releases for fuel, a certificate has to be released or provided to a company that has to get the fuel and at the end of the day that fuel is transported to a service station," Minister Gumbo said. Minister Gumbo said his ministry was responsible for facilitating fuel imports into the country by negotiating with suppliers. It is brought in via the Feruka Oil pipeline through Beira, Mozambique. Some of it goes to Zambia, DRC, Malawi and other countries. "What happens is that fuel can only be accessed after payment of forex by our local companies," he said. "Also there are facilities we negotiate as a ministry, and that is our role." Currently, Zimbabwe is getting its weekly supplies from a number of suppliers including Trafigura (20 million litres), Independent Petroleum Group (IPG) (12 million litres), Total (7-10 million litres), ENGEN (7 million litres), and Straus (7 million litres). Cumulatively, the fuel firms supply an average of 45 million litres into the market weekly. Government also negotiates fuel supply facilities over 90 to 120 days, but the arrangement at times gets encumbered by the shortage of forex. 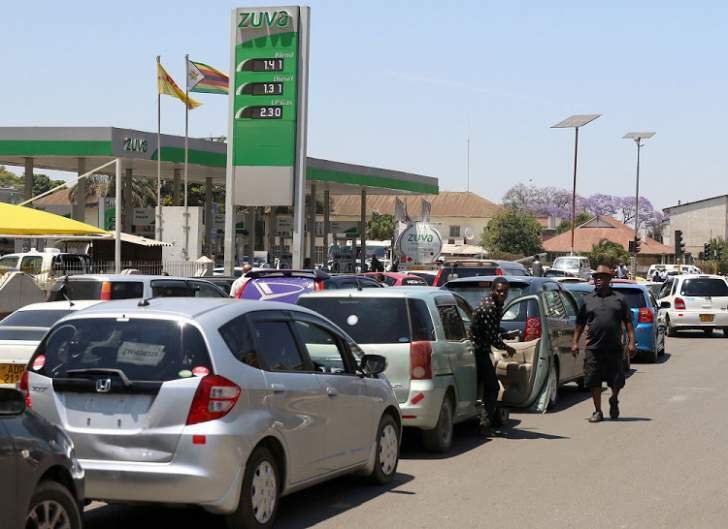 Amid fuel shortages in Zimbabwe, Minister Gumbo said Government had witnessed a case in Zambia, which went to court after some people were arrested after smuggling fuel in 15 tankers with the intention to resell the fuel in that country.